Your most important thoughts deserve a proper place to be written. 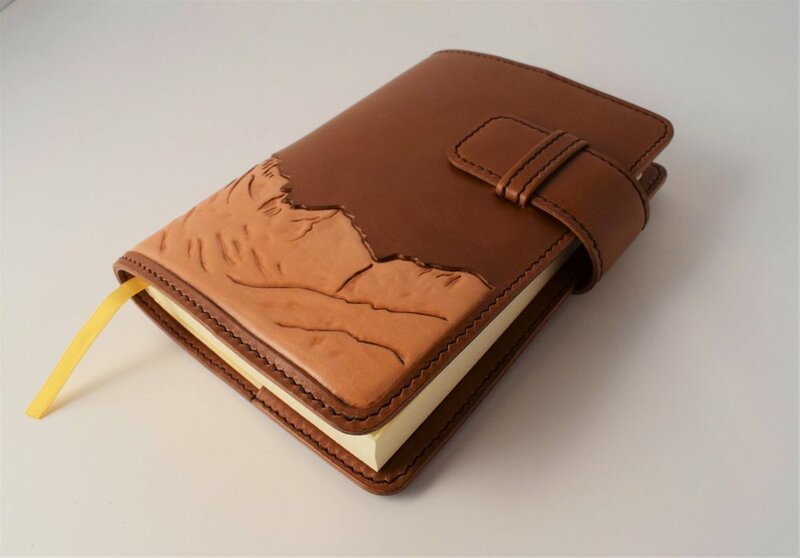 Carefully handcrafted, this refillable journal cover will ensure your memories will be protected for a lifetime. Avid journalers are familiar with the frustration of having to search out the perfect new journal each time one is filled. After spending so long falling in love with the previous, it's tough to start over. The beauty of a refillable journal cover is you'll never have to start over again. Made to fit a 5"x7" journal refill, this cover can be tailored to your specific needs. A pen loop addition will ensure your favorite writing utensil is always at hand, and a closure system will keep everything secure. 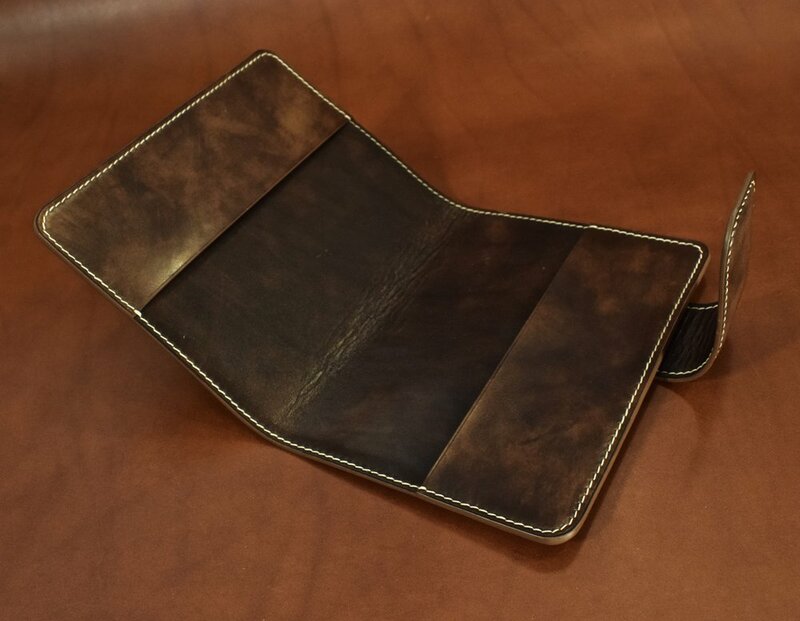 Additionally you can choose between a variety of leathers for a more luxurious feel, or make things more personal with a completely custom artistic design. From the start, this journal cover will reflect who you are, and with time will reflect the lifetime of memories recorded within. 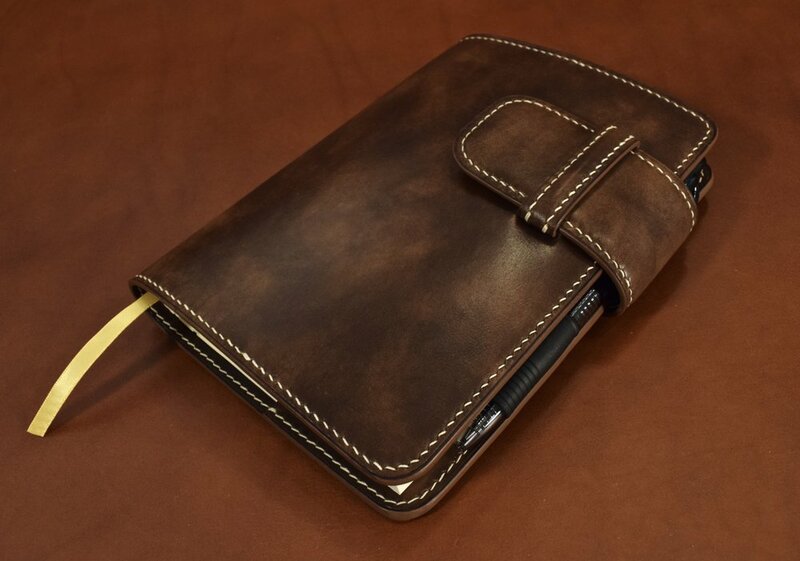 Each cover is made using only full grain leather that will grow even more beautiful with time. The process begins by transferring my personal template to leather and hand cutting each individual piece. Careful attention to detail is given to the closure as the padding is shaped by hand to create a soft rounded look. The pieces are then hand sewn in place with the finest linen thread using the the incomparably strong traditional saddle stitching technique. Edges are hand burnished and polished to a naturally beautiful sheen or layered with edge paint and heat treated for a smooth finish according to your preference. Finally conditioner is applied and hand buffed before the cover finds its way to you. Begin the process of creating your lifelong, hand-crafted journal cover today. Only if different from cover. Availability will vary, but I will do my best to ensure you receive your desired color choice. Only if closure other than Double Pen Loop was chosen.